German Chancellor Angela Merkel calls for "collective answer" by the UN to the chemical attack in Syria. 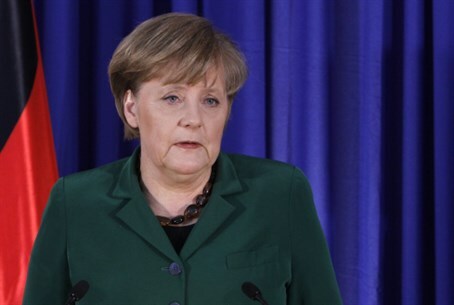 German Chancellor Angela Merkel and her challenger in the country’s upcoming election both said on Sunday they would not participate in military action against Syria, reports the Associated Press. Merkel said that "Germany will not participate" in a military strike as she faced center-left rival Peer Steinbrueck during a televised debate before the September 22 vote. Merkel said that there needs to be "a collective answer by the UN" to the use of chemical weapons in Syria. She added she is "very glad that we have a few days" to revive efforts to secure UN action, a reference to President Barack Obama's decision to seek authorization from Congress for military action, thus delaying the planned strike for now. Steinbrueck said he wouldn't participate in military action as chancellor and would "greatly regret it" if the U.S. strikes alone without an international mandate. The United States has been trying in recent days to secure an international coalition for a strike in Syria. By ruling out intervention in Syria, Germany joins Britain. Last Thursday, British MPs voted to reject possible military action against the Assad regime in Syria to deter the use of chemical weapons. A government motion was defeated by 285 to 272. British Prime Minister David Cameron said following the vote that it was clear Parliament does not want action and added that "the government will act accordingly." Despite the result of the vote, the U.S. said it would continue to seek a coalition for military intervention. French President Francois Hollande gave a boost to the American efforts, saying the British vote would not affect his government's stance. "France wants firm and proportionate action against the Damascus regime," Hollande said in an interview with Le Monde newspaper. Secretary of State John Kerry was confident on Sunday that Congress will approve the attack on Syria. “I can’t contemplate that Congress would turn its back on Israel and Jordan and the allies of the region,” Kerry said on “Fox News Sunday,” saying that lawmakers had a duty to act to uphold international norms against using chemical weapons. Kerry stressed that it was important to send a tough message to other nations pursuing weapons programs, like Iran and North Korea.